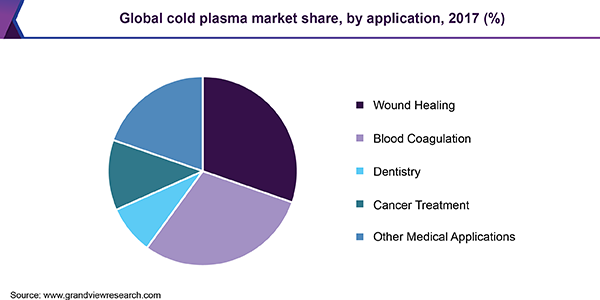 2/12/19 - Cold Plasma Market Size Poised To Reach $198.50 Million By 2026: Grand View Research, Inc.
"Grand View Research, Inc. - Market Research And Consulting.rn"
According to report published by Grand View Research, Increasing use of cold plasma in medical treatment and rising cases of Hospital-Acquired Infections (HAI) are the key driving factors for the Cold Plasma Market. In healthcare industry, plasma technology has been in use for some time and it continues to help improve various treatments. 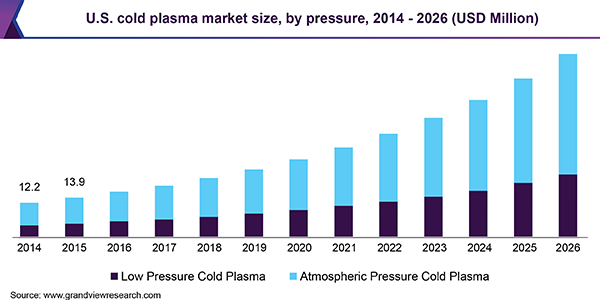 According to a new report, " Cold Plasma Market Size, Share & Trends Analysis Report By Pressure (Atmospheric, Low-pressure Cold Plasma), By Application (Cancer Treatment, Wound Healing, Blood Coagulation), And Segment Forecasts, 2019 - 2026" The global cold plasma market size is expected to reach USD 198.50 million by 2026 at a strong CAGR of 15.2%. Increasing use of cold plasma in medical treatment and rising cases of Hospital-Acquired Infections (HAI) are the key driving factors for the global market. In healthcare industry, plasma technology has been in use for some time and it continues to help improve various treatments. One of the major properties of cold plasma is the ability to kill bacteria and prevent infection. Therefore, it acts as an effective healing solution. It also accelerates healing process and prevent patient from discomfort. Have some specific queries about this report, our team of analyst will be glad to help! Cold plasma is used in the treatment of chronic wounds and burns. The bacterial cells, including Multidrug Resistant (MDR) bacteria, are instantly killed after being exposed to cold plasma. As per an article published by the Medical Xpress, Med Tech Europe, around 4.0 million people in Europe suffer from non-healing wounds every year. It also reported that a burn patient in Germany was treated using prototype plasma treatment. Moreover, as per a research published by The National Center for Biotechnology Information (NCBI), a patient suffering with two second-degree burns was treated with cold plasma, which healed the itching and pain and presented new tissue after the second treatment. Such cases are anticipated to promote the usage of cold plasma in various wound treatments. Access complete Pharmaceuticals Report Portfolio By Grand View research, Inc.
Grand View Research provides syndicated as well as customized research reports and consulting services on 46 industries across 25 major countries worldwide. This U.S.-based market research and consulting company is registered in California and headquartered in San Francisco. Comprising over 425 analysts and consultants, the company adds 1200+ market research reports to its extensive database each year. Supported by an interactive market intelligence platform, the team at Grand View Research guides Fortune 500 companies and prominent academic institutes in comprehending the global and regional business environment and carefully identifying future opportunities. Contact Person: Sherry James, Corporate Sales Specialist - U.S.A. Copyright Â© 2019 Get News. All rights reserved.